Irrespective of the fact that the Delhi Daredevils team was changed drastically in the 2011 IPL season, the past does not seem to leave them behind. In what was yet another instance of failing miserably in a semifinal game, Delhi was walloped by a more efficient Chennai Super Kings team in Chennai. Virender Sehwag has now been the captain of three IPL campaigns in which Delhi Daredevils have made it to the last four of the competition, but not gone to make it to the final, let alone win the title. This is something which he should be disappointed about to a certain extent, but more importantly learn that he needs to motivate his players even more in the times of adversity and not encourage them to play their natural game heedless of the situation. Last year, the Daredevils surprisingly decided to retain Virender Sehwag only and somehow managed to buy back David Warner and Umesh Yadav in the IPL auction of 2011. The core foreign contingent comprising of AB de Villiers, Daniel Vettori, Dirk Nannes and Tillakratne Dilshan shifted their IPL base from Delhi to Bangalore. Gautam Gambhir was sold to Kolkata Knight Riders, which meant that the team management had an uphill task to match the quality of those players while choosing a new side. They could not live up to it then, although they availed the services of players such as Irfan Pathan from Kings XI Punjab, Ajit Agarkar and Ashok Dinda from the Kolkata Knight Riders, Venugopala Rao from Deccan Chargers, Naman Ojha from the Rajasthan Royals. Amongst the foreign players, it was Aaron Finch, Travis Birt, Colin Ingram, Matthew Wade, Roelef van der Merwe and Morne Morkel whom Delhi preferred to have in their squad. All these players might be decent in T20 cricket if not threatening, but the management felt that they were capable of helping Delhi win their first IPL title ever. Unfortunately for them, it did not happen in 2011 as the Daredevils deserved to finish at the bottom of the points table by the end of the competition. Delhi prevailed in just 4 out of 14 games and finished 10th, narrowly below the new laggards of the IPL, Pune Warriors India. Virender Sehwag was literally a one-man army as he won almost all the games for his home franchise, on his own completely. Barring him, there were no big contributions as such from the rest of the players and the other teams took advantage of it thoroughly. That was Delhi’s worst season in the history of the IPL but they admirably learnt from their mistakes in order to succeed in the IPL 2012. They decided to strengthen their foreign contingent which proved to be ineffective in 2011, and maintain the Indian bowling attack comprising of Irfan Pathan, Umesh Yadav, Varun Aaron and Ajit Agarkar in their team which has enormous potential. Shahbaz Nadeem, Pawan Negi and Sunny Gupta were some of the new additions in the side. But more importantly, they made better use of the 2012 IPL auction by buying the likes of Mahela Jayawardene, who was the captain of the now defunct Kochi Tuskers Kerala, West Indies’ all-rounder Andre Russell and New Zealand’s Doug Bracewell. Outside the auction, they successfully negotiated deals with Deccan Chargers to acquire Kevin Pietersen and Rajasthan Royals to acquire Ross Taylor, and incidentally both had played for the Royal Challengers Bangalore in the first three seasons of the competition. The selection of Pietersen was a wise one not just because he is the No.1 T20 batsman in the world, but also the fact that David Warner was not available for the first half of this year’s IPL. So once he finished playing the first half of the IPL and returned to England for international commitments, Warner could come back in the team and replace him immediately. 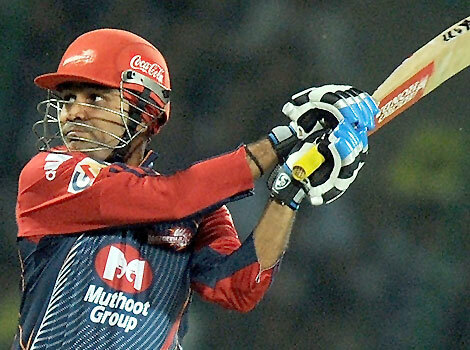 Sehwag was yet again Delhi Daredevils’ best player in the IPL, being the perfect leader for his team which needed inspiration. As captain, Sehwag was usually good at strategizing on the field and motivating his players to play their natural game, something which he does very well. While as batsman, he scored 495 runs in 16 matches at an average of approximately 35. His consistency was a major factor in seeing Delhi win 11 out of 16 round robin games and ending as the numero team on the points table. He did however; succumb to the situation in the playoff games against KKR and CSK and was perhaps responsible for tactical errors such as pushing Ross Taylor down to No.7 in the run chase against KKR and dropping Morne Morkel for Andre Russell in the CSK game. Morkel was as good as flawless this season. The South African paceman proved that he is not a misfit for the T20 format, as he has become a much better death overs bowler in particular. Much like Malinga, he would torment batsmen on a regular basis and without him; Delhi’s bowling attack actually looked toothless. He finished with 25 wickets in the 16 matches he played, which made him slightly edge past Sunil Narine to win him the Purple Cap award. It was perhaps Delhi’s biggest mistake to leave him out for the playoff match against Chennai Super Kings in Chennai, and one cannot help but feel for him. Pietersen was available only for the first eight matches of this year’s Indian Premier League. Yet, he impressed by being more calculated in his stroke play but at the same time, not losing his flamboyance. His hundred against the Deccan Chargers was one of the finest hundreds of this year’s IPL. He averaged 61 and had a strike rate of 147.34, which is outstanding for a No.3 batsman in the T20 format. KP seemed to be enjoying more with the Delhi Daredevils this year, then with the Royal Challengers Bangalore in the past. It was Pietersen’s contributions which made Delhi go on top of the table from before itself and it is unfortunate that his exit made the Daredevils batting order slightly weakened. The Vidarbha pacer just seems to get better and better with every IPL played. It is in this tournament that he actually made a name for himself, having turned up for the Delhi Daredevils itself for the first time in the 2010 season. The team management believed that he is a talent who is hard to let go and successfully bought him back again. He has repaid the faith this time as well with as many as 19 wickets in 17 games, playing the perfect support pace bowler to Morne Morkel. His contributions have been vital in Delhi finishing in the last four yet again. These are good signs for India in the long run, as he is likely to be the team’s bowling spearhead after Zaheer Khan. A fine IPL performance also is likely to get him a place in India’s World T20 squad this September. Warner joined the team in the second half of the IPL season, almost immediately after KP left for England. The Australian opening batsman was not at his very best in the 2012 edition of the competition, since he performed better in the previous years. Yet, he overcame a potential jetlag and exhaustion arising from a punishing international cricket season by hitting an outstanding unbeaten century against the Deccan Chargers in Hyderabad, chasing down a total of 190 successfully. In this sense, Warner played more than decently and tried to partner Sehwag as much as possible. His season tally is 256 runs in 8 games at an average of 36.57 and a characteristic strike rate of 164. Delhi’s most expensive player had a good IPL season, definitely better than 2011. He proved why he can be such an asset in the shortest format of the game, as he was the all-rounder Delhi needed badly to perform. He hit 176 runs in 17 matches, which is not poor for a man who usually is subjected to bat lower down the order. His hitting abilities were seen in the very first game Delhi played in the IPL 2012, against the Kolkata Knight Riders in Kolkata where he hit a 20-ball 42 batting at No.3 and won his team the match. Whereas, his bowling was average as he picked 8 wickets in 17 games but such was his presence in the team, that he was really missed in the playoff match against Chennai Super Kings in which he was absent due to an injury. He will remain the key in maintaining this team’s balance. Ojha is one of the unsung heroes of the Daredevils side, which completed an impressive turnaround this year. With so many superstars in the side, it helped the wicketkeeper batsman from Madhya Pradesh to focus on his game and give it his best shot. He was unfortunately shuffled up and down the order on a regular basis, but that did not deter his focus and played his role to perfection. He scored 255 runs, being one of the few players to have played all the 18 matches of Delhi this season. Not bad, considering the pressure his role can generate within him. He was one of the best Indian wicketkeeper batsmen to have done well this year, ahead of his counterparts such as MS Dhoni, Dinesh Karthik and Robin Uthappa in terms of both batting and wicket keeping. His catch in the playoff game against Chennai Super Kings to dismiss Albie Morkel was indeed one of the very best of the IPL 2012 in which he dived to his right, hardly having any reaction time. Nadeem is easily one of the rising stars of Indian cricket, with his performance in this year’s tournament. The left arm spinner from Jharkhand tried his level best to ensure that Delhi’s bowling attack was complete when he was in the playing XI. He picked 8 wickets in the 12 matches he played, at a decent economy rate of 7.06. He was more of a container than a wicket taker, but he did famously pick Richard Levi and Davy Jacobs in one over in the match against Mumbai Indians at the Wankhede Stadium. He should get more opportunities in the future and better performances will prove that India’s spin arsenal is efficient enough to compete in international cricket. The Sri Lankan skipper was expected to fire on all cylinders, come the 2012 IPL season. Consistency has always been his middle name, but he did not live up to it this year for the Delhi Daredevils. For most of the tournament, he struggled to make a big contribution for the team and the others were responsible for helping them win matches. Mahela was fortunate enough to get away with his performances. He scored 335 runs in 16 matches, at an average of 28. These numbers are never associated with a player of his calibre, but he did show why he is a player to rely on in pressure situations with impressive knocks against the Kolkata Knight Riders and the Chennai Super Kings in the playoff matches. He seemed to be the only man to show some stomach to help his team chase down big totals, although his efforts went in vain. Nagar’s performances were hardly noticed but he did play an important role in helping Delhi Daredevils defeat teams such as Rajasthan Royals and Deccan Chargers. Getting to bat lower down the order, he had to play the role of a finisher who had to either hit out or get out and be content with how many runs he ended up with. A tally of 153 runs in 13 games does not sound catchy to the human ear, but an average of 30.60 per innings does considering that IPL is a form of T20 cricket. His consistency might make the Delhi team management ponder whether to promote him up the order in the future. The only question is – Who will he replace? Aaron was injured for the first half of the IPL, but Delhi did not miss him too much due to the exploits of Morkel and Yadav. However, once he returned he showed why he must be a crucial part of the team’s pace attack. His speeds are impressive and on flat tracks especially, he can be too hot to handle for opposition batsmen. He is a wicket taking bowler, so Delhi Daredevils needed much more from him especially in crunch games when Delhi struggled. His inexperience made him fail in yesterday’s match against Chennai Super Kings, which was his true test. He picked up 8 wickets in 8 games he played, but his economy rate of 8.74 is poor even if the T20 format is naturally punishing for bowlers. Yet, he is another potential pace talent for India in the future and he and Yadav can form India’s new ball opening pair too. Negi was mainly a replacement for Shahbaz Nadeem, since he is a left arm spinner who can bat better than him. His inclusion made the batting depth even greater than before and in the limited opportunities he got, he proved that he can bat in this format of the game with a strike rate of approximately 125. But his bowling figures were more impressive as he picked 7 wickets in 8 games, with the best of 4/18 and an economy rate of 6.90, which is brilliant for a T20 bowler. He also needs to get more chances to prove himself but this is a good start to his IPL career. This year has been one hell of a struggle for the captain of New Zealand. He was ironically injured by Morne Morkel in a Test match against South Africa in New Zealand, which is why he missed out a few matches at the beginning of the competition even though he did not have international commitments. Delhi picked Taylor in their squad for the IPL 2012 believing that he could play a fine supporting role to the likes of Sehwag, Jayawardene, Warner and Pietersen. But he did not do justice to the big name that he is in T20 cricket at all. Taylor did find some form towards the end of the tournament, but that was unable to overshadow his consistent failures. A tally of 197 runs in 12 matches hurt the team’s chances of winning the title, and worst was that the Daredevils did not wish to remove him from the team when they could have replaced him with the likes of Andre Russell or Roelef van der Merwe who are all-rounders suited to play the T20 format. Rao once again proved to be an underperformer to his abilities. The ex Deccan Chargers player is not having a great time with the Delhi Daredevils either, as he finished with 132 runs in 10 matches that he played with a highest score of 36 only. Rao can be handful for the Daredevils in case the top order fails, but the question is when he can get back the same form which he had in the 2005-06 season? Let us not forget that he has played for India in ODI cricket, so such a performance cannot be ignored. The West Indies’ all-rounder only got to play 4 matches in this year’s IPL which is a bit sad considering the potential that he has. Yet in those 4 games as well, he could not prove himself at all as he picked 1 wicket only and scored 47 runs. But a strike rate of 180 is outstanding, and his hitting can be dangerous for any opposition as he was close to help a weakened Delhi Daredevils team to chase down a total of 216 at the Feroz Shah Kotla against a Royal Challengers Bangalore side which was pumped up after a Chris Gayle hundred. This was the very first match Delhi Daredevils played in the IPL 2012 and still it was an uphill task for them to defeat an equally strong Kolkata Knight Riders side at the Eden Gardens. Fortunately for the Daredevils, they won the toss and put the home team into bat after the match was reduced to a 12 over affair following intermittent rain. Morne Morkel lit up the tournament in the early stages itself, by picking 3 wickets for 18 runs in 4 overs. Amazing as the bowling figures sound, the South African fast bowler’s efforts in the nets of improving his yorker length deliveries paid off in this game. This was the beginning of his journey of gaining the Purple Cap this season, which indicates that he has picked the highest number of wickets amongst all bowlers in the 16 round robin games of the tournament. The wickets Morkel picked were those of his South African teammate, Jacques Kallis, skipper Gautam Gambhir and Manoj Tiwary and all three were bowled. This derailed the Knight Riders’ batting so much so that it needed some hitting from the rookies Debabrata Das and Laxmi Ratan Shukla to make the team reach a fighting total of 97/9 in 12 overs. Umesh Yadav and Roelef van der Merwe were amongst the wickets as well. Delhi managed to overhaul the target with five balls to spare courtesy Irfan Pathan’s unbeaten 20-ball 42, having surprisingly been promoted up to No.3 for this game. The bottom ranked team of the last season had started off on a winning note, defeating a side which finished in the last four. Kolkata were completely outplayed, but in Delhi’s perspective, this was the win they needed to begin their surge in becoming one of the powerhouses of the IPL again. Royal Challengers Bangalore started off this year’s IPL campaign in style like the Delhi Daredevils. But for that, they beat the Daredevils at home by an impressive 20 run margin. Delhi were still a weak looking team in the absence of Pietersen, Jayawardene, Warner and Taylor at this stage of the competition and this is the incentive Bangalore needed to win the game. The home team reached a total of 157 for 8, a modest total by the pitch standards set by the Chinnaswamy groundsman. Morne Morkel picked 2 wickets in this game while Doug Bracewell of New Zealand had an excellent IPL debut, with 3 wickets in his 4 overs. Sehwag, who won the toss and elected to bowl first, was dismissed for a golden duck by his India teammate Zaheer Khan. After that, Delhi were never in the game as meager contributions took the team to a final total of 137 for 7 in 20 overs. Although AB de Villiers won the man of the match award for his unbeaten 42-ball 64, Muttiah Muralitharan’s 3 wickets were crucial to deny Delhi another away win. It showed that the team still had a long way to go, even if this was just the beginning of the competition. Delhi Daredevils’ first home game of the season was against the defending champions, Chennai Super Kings. Sehwag was not afraid of fielding first yet again after winning the toss. But this time he was correct in his decision because it had rained in Delhi for a short period of time, prior to the beginning of the game. That had made the pitch much slower than it actually was. And to make things better, Chennai’s batting line-up was struggling to make an impact in the competition. Chennai never got going and suffered as many as four run outs, which made them end with a paltry total of 110 for 8 after 20 overs. Morkel again picked up 2 wickets to help Delhi gain an upper hand by the end of the first half of the game. But Delhi had no difficulties whatsoever in chasing down 111, as Sehwag started the innings off extremely well for his team as he has done in the past on several occasions. He scored 33 runs in 21 balls, and that had already demoralized the Dhoni-led bowling attack. Kevin Pietersen, playing his first game in Delhi colours in the IPL 2012, started off the tournament in fine fashion, remaining not out after scoring 43 runs in 26 balls. He carried on the good form that he was in Sri Lanka and did not seem to be exhausted one bit. But Morne Morkel was the man of the match for his bowling performance as this win gave Delhi a lot of confidence for the following games. This is a game which saw the Delhi Daredevils bowlers once again set up the victory, by making the situation simpler for the batsmen and proving that they are not just a batting powerhouse. Their opponents were the Harbhajan Singh-captained Mumbai Indians team at the Wankhede Stadium. The pitch had a bit of juice in it, which might have aided the bowlers at the beginning of the game. This is why Sehwag perhaps decided to bowl first yet again, after winning his fourth toss in a row. Only Rohit Sharma and Harbhajan reached double figures as Delhi shockingly dominated a Mumbai batting order minus Sachin Tendulkar. Harbhajan top scored with 33 as Delhi’s bowlers kept taking wickets at regular intervals. Shahbaz Nadeem, the left arm spinner proved why he could be one of the rising talents in Indian cricket by picking the wickets of the South African opening duo of Richard Levi and Davy Jacobs in his very first over of the game. The younger Morkel picked two more wickets and so did Yadav. Ajit Agarkar also used his experience of the Wankhede to the fullest. Mumbai were shot out for 93, and it was only a matter of time before Delhi won the game comprehensively. Nadeem was easily the man of the match and the Daredevils had already got three wins out of four, that too against Kolkata, Chennai and Mumbai which are the strongest teams in the competition. The first game of the IPL 2012 in which Delhi Daredevils had to struggle to gain a victory. Although Deccan Chargers were languishing at the bottom of the points table, they did give a resurgent Delhi side a tough fight at the Feroz Shah Kotla in a 4 pm game. Once again, it had to take the likes of Morkel and Nadeem to restrict the Chargers to 157 in 20 overs, as both picked three wickets each. Delhi were struggling at 23/3 in less than five overs and seemed to be going down the barrel, since Sehwag, Jayawardene and Ojha were dismissed without troubling the scorers much. Ross Taylor fell soon after and thus Kevin Pietersen decided to take matters into his own hands. Snubbed by the Chargers this season, he made them pay for this mistake heavily. This was by far one of the best hundreds in the history of the IPL not just because he hit as many as nine sixes, but mainly because he hardly had support from the other end. KP proved why he is the best in the business at the moment in T20 cricket and justified his million dollar price tag. Unbelievably, it was KP’s first IPL century which made Delhi win a lost game by 5 wickets with 5 balls to spare. He ended with 103 not out off just 64 balls. This was Delhi Daredevils first home defeat of the season, and they suffered it in the hands of the then in-form Pune Warriors India. Once again, Viru bravely decided to field first after winning the toss. Chasing a total was becoming a tradition of sorts for the Daredevils irrespective of the opposition or the venue. But the strategy did not work against an inspired Pune team led by Sourav Ganguly. For the first time, Delhi’s bowling looked listless as Morne Morkel was hammered for 50 runs in his 4 overs even as he picked all the 3 wickets of the Pune innings. Ganguly finally found some form and with the help of master hitting from Jesse Ryder and Steven Smith, Pune Warriors India reached a monumental score of 192 in 20 overs. This was the real test for the much hyped Daredevils batting line up but it failed that day. Sehwag scored another quick fire fifty to give his team a flying start but with the wicket of Kevin Pietersen, he was unable to find solid support from the other end and as a result he perished trying to attack and attack. Ganguly’s wicket of Pietersen off his very first ball after 2 years in the IPL was one of the highlights of this year’s competition, largely because of the typical Dada celebration which followed. Dada was the man of the match deservedly, even as Alfonso Thomas’ 3 wickets were key in sentencing Delhi to a 20 run loss, their second in the tournament. If Sourav Ganguly did it in Delhi for his team being the captain, it was time for his counterpart and protégé Virender Sehwag to do it in Pune for his team being the captain. For the first time, Delhi did not win the toss but still had to chase a total. Ryder and Ganguly, the heroes of the last encounter, were dismissed inside the first 2 overs by Irfan Pathan and Morne Morkel respectively. Delhi’s bowlers proved that in T20 cricket, it is possible to contain batsmen if not pick up wickets in regular wickets. Pune ended shockingly at 146/2 after 20 overs, with Robin Uthappa playing an uncharacteristically slow knock and remaining unbeaten in the end. This was another game in which Sehwag took the game away from the opposition singlehandedly, as he smashed 87 runs in 48 balls and guided his team home with 24 balls to spare. His innings was important to keep the Delhi Daredevils still ranked No.1 in the points table. A match which was hyped to be the heavyweight clash of the IPL and a revenge match for the Mumbai Indians turned out to be another damp squib. There was fundamentally nothing wrong in Harbhajan Singh’s decision to send the Delhi Daredevils into bat first. But the manner in which Delhi manhandled Mumbai’s bowlers, proved why they deserved to be on the top of the table. Mahela Jayawardene finally got going in the IPL 2012 with a fifty opening the batting alongside the in-form Sehwag, who also bought up another fifty. Pietersen played the role of a finisher exceptionally well, batting at No.3 as he ended unbeaten on 50 off only 26 balls. Mumbai Indians were left to chase a massive 208 runs in 20 overs and it was always an Himalayan task for them, even as Ambati Rayudu and Dinesh Karthik kept them in the hunt for a couple of overs. Barring Morkel, most of the bowlers were expensive but picked up wickets which allowed Delhi to register a convincing 37 run win. This was another home game which Delhi deserved to lose, but incredibly came from behind to win. Sehwag was again Delhi’s saviour, smashing a 39-ball 63 while the others struggled to contend with the heavy spin attack of the Rajasthan Royals. This was after Sehwag won the toss and for the first time decided that Delhi would bat first. Thanks to some hitting in the last few overs by Yogesh Nagar, Delhi Daredevils finished with 152 in 20 overs. But this was still a below par score on that Feroz Shah Kotla and the Royals had the batting ammunition to chase down the target successfully. Like they did against Pune, Delhi contained Rajasthan’s batsmen very well. They were helped by Rahul Dravid’s sedate style of batting, but the Brad Hodge threat was handled brilliantly. But it was Ajinkya Rahane who actually threatened to take the game away from the home team with his 63-ball 84. All was going well for the Royals, until Morne Morkel bowled one of the better penultimate overs one can ever see and that too against his former franchise. He gave away only 3 runs and picked that crucial wicket of Hodge which ensured that the Royals needed 12 off the last over which was to be bowled by Umesh Yadav. Owais Shah was run out on the last ball of the match and Delhi prevailed by 1 run. This was one of the closest finishes of the IPL 2012 and certainly the best match of the competition. Rajasthan were gunning for revenge at home, and they were confident despite the 1 run defeat in the last game. They decided to do what they did best at the Sawai Mansingh Stadium, bat first after winning the toss. Dravid and Rahane were the only two batters who contributed largely to Rajasthan’s poor score of 141/6 after 20 overs. Pawan Negi, the rookie left arm spinner picked up 4 wickets for 18 runs in 4 overs. In the run chase, Sehwag produced his fifth fifty on the trot; easily a record in the history of the IPL by any batsman and this was a testimony to his consistency and his love for the T20 format. Kevin Pietersen scored 36 runs from 34 balls in what was his last game of the IPL 2012, before he had to leave for international commitments. Delhi gave a perfect sendoff for KP by winning against the Royals in their ‘fortress’ by 6 wickets. It was in this game that Delhi directly swapped Kevin Pietersen for David Warner. Delhi astonishingly chose to bat first after winning the toss. Warner and Sehwag tried to demoralize the Knight Riders right from the word go, until Sehwag’s consecutive fifties streak came to an abrupt end when he was dismissed for a 9-ball 23 by the legendary Jacques Kallis. Warner was also a bit rusty coming straight from playing Test matches in West Indies, but Kolkata was always attacking Delhi. Irfan Pathan almost reminded Kolkata about his pyrotechnics at the Eden Gardens, but he was dismissed at the right time and Delhi were restricted to 153/9 after 20 overs. Kolkata Knight Riders was always dominating the run chase, as the top three of Brendon McCullum, Gautam Gambhir and Jacques Kallis were in good nick. But it was McCullum who finally made a significant contribution with the bat for KKR with his 44-ball 56 which was not that entertaining, but made his team win by 6 wickets. With this, Delhi lost their No.1 spot for a couple of days to the equally dangerous Kolkata side. This was Andre Russell’s first game in this year’s competition after repeatedly missing out a place in the starting XI. The Caribbean all-rounder opened the bowling but did not have a successful debut against the bottom ranked Deccan Chargers team in their backyard. The home team chose to bat first on a placid pitch after winning the toss. And what followed were brilliant fifties from Shikhar Dhawan and Cameron White and it was Varun Aaron’s superb spell of 2/30 in 4 overs that made Deccan score 187 in 20 overs. But what followed was an onslaught by the Delhi top order of the Deccan bowlers. Not many would have put their bucks on a Daredevils victory but David Warner returned to his natural style of batting by slamming 109 runs off 54 balls and remaining unbeaten in the end. It was an imposing knock which could not have been achieved without the support of Naman Ojha who also displayed the talent he possessed by playing a calculative knock of 64 runs off 46 balls, following a rare and early dismissal of Sehwag. A crushing 9 wicket win in Hyderabad was all that Delhi needed to regain the No.1 spot. It was in Chennai that Delhi were outplayed for the first time in an IPL 2012 match. Dhoni’s men had gained confidence by then, so this was actually considered to be an important match for both the sides to win. But Chennai needed this win more than Delhi to stand a chance to qualify for the playoffs stage yet again. And it showed in their game that day. After sending Delhi into bat, Chennai reduced the opposition to 24/4 inside 6 overs, with Ben Hilfenhaus uprooting Sehwag’s off stump being one of the highlights. The Australian also was responsible for dismissing his countryman Warner and Ojha. Yogesh Nagar restored some pride in the Delhi innings, but 114/5 after 20 overs was never a winning total even on the worst Chepauk pitch. It was a facile chase for CSK, but Murali Vijay gained the most out of it by guiding his team home with an unbeaten 48 off 40 balls. A couple of weeks later, he would go on to torment Delhi even more on the same ground. Kings XI Punjab had been one of the most unpredictable teams this year in the IPL. But David Hussey, the stand in captain bravely won the toss and chose to bat first against a side they were playing away from home and which was the most comfortable chasing a total rather than batting first. Hence, Hussey himself had to take responsibility of that decision by hitting 40 runs in 35 balls and being not out in the end as none of the batsmen stepped up against a confident Delhi attack. Delhi Daredevils were left to chase 137 to win but again Delhi’s top order was blown away, this time by the newbie Parwinder Awana who picked up three wickets when Delhi’s score reached 37/4 after 5.4 overs. It had to take another master class from Jayawardene to see Delhi home and Naman Ojha once again was the unsung hero for the Daredevils, playing an invaluable knock of 34. Delhi won by 5 wickets with an over to spare. Delhi Daredevils decided to rest Virender Sehwag and Morne Morkel, two of their pillars for this game. Mahela Jayawardene took over the leadership reins for Delhi and Ross Taylor was back in the team. Jayawardene won the toss and asked Bangalore to bat first, but he had no clue that the Gayle thunder would hit the Feroz Shah Kotla terribly. Without Morkel, the Delhi bowling attack was not the same one that was dominating other teams throughout the competition. Gayle decided to take full advantage of it and slam 128 runs off just 62 balls and remaining not out in the end. It was proven that Delhi were not as invincible as their position in the points table would otherwise show. Virat Kohli, in his home ground also found form by hitting 73 runs off 53 balls and walking back to the pavilion with Gayle once the 20 overs were done. A mammoth score of 215/1 was a tough chase for the Daredevils without their captain Sehwag. Yet, Venugopala Rao showed glimpses of his talent with a 24-ball 36 and set the foundation for Delhi to at least have a close shot at the target RCB set for them, if not win the game. If Kohli found form in this match, so did Ross Taylor. Taylor’s inclusion raised many eyebrows but he proved why he is a good buy still for Delhi with a brilliant 26-ball 55. Bangalore is one of Taylor’s former teams and they could not breathe easy as long as he was at the crease, even as the required run rate was under their control. Andre Russell hit 31 runs in 15 balls only, but these contributions did not help Delhi pull off a stunning chase as Bangalore won by 21 runs in the end. This game showed that Delhi can give a tough fight to teams even without VIru and Morkel. This was Delhi’s final league game in the IPL 2012 where they were only playing to retain the No.1 spot. So Sehwag was rested again, but Morkel returned to replace Taylor which was unfortunate for the Kiwi skipper. And it seemed that he needed the break badly as he returned to haunt the Kings XI Punjab batters this time, with figures of 4/20 in 4 overs. Umesh Yadav gave only 19 runs but picked 3 wickets. Yet, Punjab managed to reach 141 with some lustrous hitting in the death overs. Warner again showed why he is one of the finest batsmen in T20 cricket in the world at the moment with his 79-run knock scored off just 44 balls as Delhi thrashed Punjab by 6 wickets and with that, qualified for the playoffs stage easily while Punjab were knocked out of the competition. Kolkata was Delhi’s biggest impediment in winning the IPL this year, having fought neck-to-neck with them in the points table. Kolkata courageously batted first after winning the toss and Delhi had the game in their hands in the first 16 overs, having reduced the Gautam Gambhir-led team to 106/4 in 16 overs. But Yusuf Pathan suddenly returned to form with a blistering 21-ball 40 and superb hitting from Laxmi Ratan Shukla made the Knight Riders reach 162/4 in 20 overs. The Pathan and Shukla blitzkrieg seemed to have demoralized the team as Delhi failed to plan well for the chase. Sehwag and Warner typically went after the bowling, but both of them were dismissed within the first 13 balls of the chase. Hence, it was upto Jayawardene and Ojha once again to rescue the Daredevils and they did to an extent. But the Knight Riders were always in control of proceedings and knew that they had to pick these two and their task of winning would then become a foregone conclusion. It was a shocker to see Ross Taylor bat as low as No.7 in a crunch game and the inexperienced duo of Rao and Negi were sent ahead of him. Naturally, Delhi collapsed and with 2 wickets each for Kallis and Narine, Kolkata won by 18 runs and advanced automatically to the final. Fortunately for the Daredevils, they had another opportunity to take their revenge on Kolkata in the final. But for that, they had to get the better of a surging Chennai Super Kings side in Chennai. It was as if Delhi Daredevils gifted this game to the Chennai Super Kings, even before they played them. Morne Morkel, the Purple Cap holder of the competition, was dropped much to the chagrin of the cricket fan. The reasoning of Andre Russell replacing Morkel for this game is because Irfan Pathan is injured and they needed another all-rounder to maintain the balance of the team. But this is no excuse because it is better to retain a bowler who can pick wickets for the team and contain the opposition batsmen even if he cannot bat, rather than an all-rounder who can be erratic and is inexperienced to play a semifinal like game in the IPL. Secondly, the unknown Sunny Gupta was asked to make his debut in the IPL ahead of Shahbaz Nadeem, who has already played a lot of matches in the competition. Sehwag won the toss and elected to bowl first, followed by which he gave Gupta the first over to bowl with Murali Vijay and Michael Hussey being the two openers. Obviously, the debutant would be under more pressure than before to deliver and he succumbed. Delhi had lost the game once Vijay started to gain confidence. The Tamil Nadu opener again showed his liking for a pressure situation by hitting a hundred in Chennai. His 113 came off 58 balls and was reminiscent of his innings in the final against the Royal Challengers Bangalore last year. MS Dhoni and Dwayne Bravo again finished proceedings for CSK in still as they reached the highest team total of this year’s IPL. 223 was always out of Delhi’s reach although Jayawardene again showed his big match temperament by playing an innings similar to the World Cup final last year against India. But none of the others scored much, as Chennai kept taking wickets from time and time and fielded brilliantly, which frustrated Delhi’s so called best batting line-up of the IPL. Chennai won by a thumping 86 run margin, easily Delhi’s biggest defeat in the IPL 2012 and it unfortunately signaled another exit of the Daredevils from the competition after making to the last four. They needed one good spinner and one stable batsman in the middle order. Shehwag and Warner are 2 most unpredictable power hitters. If they get going they stop only with a win. After them they had no other batsmen to carry on. Mahela is good but not a match winner. In last match they failed miserably in fielding and they couldn’t find good line and length in bowling. Just after first ball I knew they are going to loose. It was all written on their faces. Time to do some homework and assemble a better team next year. Viru needs some lesson in captaincy and the whole team needs someone who can keep them inspiring all the time. They also need to spend more to acquire few good players. I think apart from the problem of not having good spinners or stable middle order batsmen, Sehwag needs to get rid of the mindblock that Delhi is under pressure in a semifinal or a crunch game rather than the opposition… It is under his captaincy that Daredevils made it to the last four thrice, but could not go on to win the IPL.